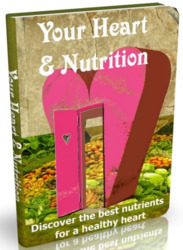 Heart disease is the number one cause of morbidity and mortality in Western society. This problem has become well recognized in the literature over the past few decades, and researchers have mounted intense efforts to remedy the situation. A heart transplant is clearly the most effective therapy for patients with advanced heart failure; it is able to restore them to a near-normal lifestyle, and long-term survival is excellent (1). However, the number of donor hearts available for transplantation is limited to only about 2000 each year, compared to over 10,000 people each year who could benefit from such a therapy. Successful development of a total artificial heart or advanced ventricular assist devices could help resolve this imbalance. Development efforts to do so were organized under the National Institutes of Health leadership in 1964. The ideal pump was originally thought to be a totally implantable device, with an electrical motor that could completely replace the heart function physiologically as well as anatomically. Yet, despite many decades of research, we still do not have such a device. In the mid-1970s, parallel research on ventricular assist devices took place; the result was a variety of ventricular assist devices described in this chapter. The human heart is a volume displacement pump. To create a unidirectional flow with a single pumping chamber, inflow and outflow valves are required. 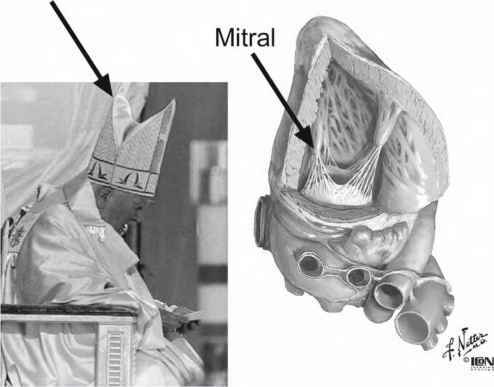 For example, in the left ventricle of the native heart, the mitral valve functions as the inflow valve; the aortic valve functions as the outflow valve. The result is unidirectional blood flow. Similarly, ventricular assist devices designed as volume displacement pumps would require these two types of valves. Some ventricular assist devices have incorporated mechanical prosthetic valves; others have utilized bioprosthetic valves (Fig. 1). Importantly, the choice of valve mandates different types of anticoagulation therapy and thus leads to a different natural history of valve failure. A major obstacle in designing clinically acceptable ventricular assist devices has been the array of problems associated with the blood contact surfaces. Specifically, any type of stagnant blood flow within the pocket of the pumping chamber can result in thrombus formation. Also, the artificial blood contact surface is quick to promote a clotting cascade, resulting in significant thromboembolism. Yet, initial attempts at making the blood contact surface as smooth as possible have not yielded satisfactory outcomes. One proposed solution for this was the construction of textured blood contact surface to promote early platelet and fibrin deposition, which resulted in formation of stable pseudointima; such a design was applied in the HeartMate® system (Thoratec Corporation; Pleasanton, CA) (Fig. 2) (2). Fig. 1. 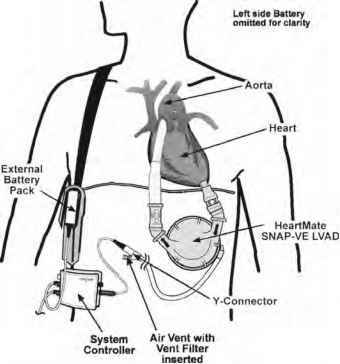 Schematic of a HeartMate® SNAP-VE ventricular assist device system. One can see the internal connections at the apex of the left ventricle where there is inflow into the device and outflow connected directly to the aorta. This system utilizes an external battery pack and controller system. LVAD, left ventricular assist device.